The above verse describes how Sundaramurthy Nayanar stood gazing at the dancing posture of Lord Nataraja in Chidambaram. He was in an ecstatic state of joy with his five senses of sight, smell, taste, hearing and touch all resolved into eyes which was focussed on Lord’s form, with his internal organs of mind, memory, intellect and ego dissolved into mind which harboured only thoughts of the Lord and with all the three Gunas of Satva, Rajas and Tamas united into the gentle Satva. That is the total fixation he had on Lord’s form while worshipping him. He was a great ananya bhaktha and his work on Saivite devotees, Thiruthondathogai (திருத்தொண்டத்தொகை), formed the basis of Sekkilar’s composition of Periya Puranam. At the same time he was also an artharthi bhaktha , as he had been taking liberty with the Lord seeking worldly favours, even to the extent of praying to Lord to plead for him to his estranged wife. We shall see all that briefly in this blog. He was born in a devout Saiva Brahmin family. His parents named him Nambi Aruran. He was such a smart, cute child that the king watching him play was attracted to him and wanted to adopt him. With parents’ consent, the king adopted Aruran and he grew in the palace with all royal honours but without giving up the parentage or family traditions. So at the appropriate age Aruran was given the sacred thread and initiated into Vedic studies. As he completed the studies his parents arranged for his marriage with a girl of their choice. At the time of marriage, as the union was about to be formalised, an elderly gentleman interrupted the proceedings saying that Nambi Aruran had to settle an old account with him and then only can marry. When asked to explain, he further said that Aruran’s ancestor had given him a signed undertaking that his descendants will serve as slaves to him and he had come to claim his slave. He produced a palm-leaf to support his statement. Nambi Aruran called him Piththan, a madman, and violently snatched the palm-leaf from his hand and tore it to pieces. The old man began to shout that this proved he is right. Then some elders approached him, calmed him down and said they can settle the matter in the court and as the old man claimed to hail from Thiruvennainallur, he can take it to the elders’ court of that place. There the old man repeated his earlier statements and said, what was destroyed was only the copy and produced the original for verification. As it was found genuine, they gave the verdict that Aruran should go with the old man and serve as his slave until released. Nambi Aruran/Sundharar followed the old man who went into the Thiruvarutturai temple and there he disappeared. As Sundharar stood aghast in wonder, he had vision of Lord seated on the bull and there flashed in his mind old memories. Earlier he had been a close attendant of Lord Siva in Kailash with the name Alala Sundharar. Once while serving the Lord, he felt attracted to the maids of Devi Parvathi, Kamalini and Aninditi and faltered in his duties. Lord Siva ordered him to be born on earth, live out his desires and then come back to him. Sundharar made only a request that Lord should prevent him getting married to any other person to which Lord agreed. In keeping with the word, Lord has enacted this drama and saved him from this marriage, he understood. He fell down on the ground and cried out “How can I repay your kindness?” Lord replied “by worshipping me with sweet songs in Tamil” calling him a Vanthondan(வன்தொண்டன்), violent attendant, in view of his earlier fight with Him. He also asked him to start with the word pithan, mad man, which Sundharar used in anger while snatching the palm-leaf from His hand. Sundharar then sang the song that started with the words “pitha pirai chudi” (பித்தா பிறைசூடி). Transformed into an ananya bhaktha of Lord Siva, he went from place to place singing hymns in praise of the Lord Siva in the temples there. It was in Tiruvarur that he met Kamalini who was born in a temple dancer’s family and bore the name Paravai Nachiyar. She was leading a pious life devoting herself to the service of Lord in the temple. When Sundarar saw her he fell in love with her and when he heard about her devotion to Lord he was all the more eager to marry her. She also felt attracted to Sundarar, but controlling her mind she was only all eyes for the Lord in the temple and left without looking at him a second time. Sundarar now prayed to the Lord begging that he should help him get married to her and spent a sleepless night thinking of her and praying to Lord. In the meantime Paravai learning from her friends about Sundarar and his devotion to Lord, spent a sleepless night thinking about him. Lord decided to help them and he appeared in the dream of the elders of Tiruvarur and told them to arrange for the marriage of these two sincere devotees. Accordingly marriage took place and Sundarar and Paravai started living together in Tiruvarur as husband and wife. A landlord by name Kundaiyur Kizhar was in the habit of sending rice and grains to Paravai Nachiyar to help her in her annadhanam service to devotees. One time there was a severe drought and there was no grain in the granary for the landlord to send to Paravai Nachiyar. He was deeply worried that he could not support her service to devotees and that night he went to bed thinking about this only, without even taking food. Lord appeared in his dreams and told that he will get grain for giving to Aruran. Next morning he found a mountain of grain at his doorstep and he wondered how to transport it to Aruran’s house. As Lord has appeared in the dream of Aruran also and told him about the grain, he also arrived there. He was also stunned to see the amount of grain but he was not disturbed. He prayed to Lord, “I have no people to transport it. So You please have the grain transported to Paravai’s house with the army of Sivaganas at your disposal.” and left. The next morning Paravai was delighted to find stacks of grain before her house. Thanking the Lord for His benevolence she took only as much grain as needed by her and left the rest for others to take. On one occasion Paravai needed money for feeding the devotees on Panguni Uthiram day and she turned to Sundharar for help. Whom will he ask except the Lord? He went to Thirupukalur, worshipped in the temple there praying to the Lord for money to help Paravai to celebrate the festival and slept there itself without taking food. Next morning when he got up, he found the bricks he has used as pillow have turned into gold. Thanking the Lord profusely he took them to Paravai to be used in service of devotees. On another occasion when he was in the town of Thirumuthukunram, he remembered Paravai needed money and prayed to Lord for 12,000 gold coins. When this wish was granted he had another request that it be transported to Tiruvarur. To this Lord told him to drop them in Manimutharu river and pick it up later in Tiruvarur tank. He dropped them in the river and continued his pilgrimage. When he returned to Tiruvarur he took her to the temple tank, picked up the gold and gave her, much to her amazement. After staying for some time in Tiruvarur, he again left on pilgrimage. After visiting many places he reached Tiruvotriyur. At Tiruvotriyur, he met Changili Nachiyar, who was none other than Aninditi. Changili was devoting herself to the service of the Lord of the temple at Tiruvotriyur, refusing marriage. Her parents had also arranged for special secluded quarters for her near the temple. In the temple she carried her services behind a screen. As she came from behind the screen to hand over the garlands she had made for the Lord, Sundarar saw her and again fell in love. Lord being his only refuge, he prayed to Lord that he may be united to her in marriage. Lord also intervened but this time there was a snag. She said she will marry him if he promises before Lord that he will not leave Tiruvotriyur thereafter. Sundarar was reluctant to give up his pilgrimages but he also desired Changili. So he hit upon a plan. He requested Lord to leave the garbhagriha for the makizham tree temporarily while he makes the promise. Lord agreed but conveyed this to Changili. When the time for making the promise came she demanded that it be made under makizham tree as shrine was not the appropriate place for making this promise. Reluctantly he made the promise accordingly and married her. After living with her for sometime his desire to visit Tiruvarur became irresistible and so he left Tiruvotriyur without telling anybody. But as he crossed the borders of the town, he fainted and when he recovered he found he had lost sight in both eyes. He prayed to Lord for forgiveness for breaking the promise made in His presence and continued the journey singing the glory of the Lord, having the vision of the Lord in his mind only. At Kanchipuram, when he cried for Lord’s mercy, Devi intervened for him and he got back his sight in left eye. It is only in Tiruvarur as he pleaded before the Lord he got back the sight in the other eye as well. In the meantime, Paravai who had heard all about his marriage to Changili was greatly irked and refused to see him. She also refused to receive anyone in her house who came pleading for Sundarar. Sundarar was distressed and again prayed to Lord for help to secure reunion with Paravai. Lord went to Paravai’s house first as an elderly Brahmin to request reconciliation with Sundarar only to be turned back. It is only when Lord returned with His ganas and revealed Himself, she agreed bowing to Him and asking for forgiveness for showing Him the door when he came as an old Brahmin. Sundarar got reunited with Paravai. 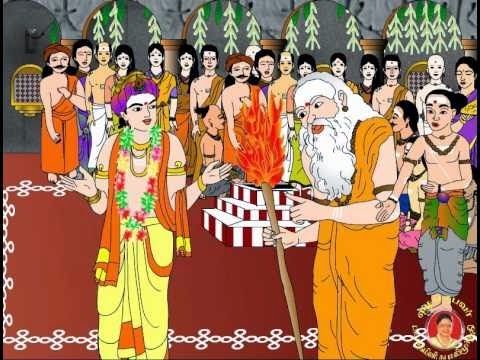 As Sundaramurthy Nayanar worshipped Lord in Sakha Marga, treating Him as a friend seeking favours time and again, while never swerving from his ananya bhakthi he is referred to as artharthi ananya bhaktha.